Trying out a new way to see your doctor can be a bit intimidating. Your health is of utmost importance, so if you have questions about how telemedicine technology will impact your encounters and your relationship with your provider, you are not alone. Here is some information that might make you feel more confident about this new option for getting the care you need. It is important to know that not every medical situation is right for a video visit. Your provider and staff know when it is safe and effective to conduct an encounter using telemedicine. For those that are, studies have shown that there is no detectable difference in the ability of a provider to gather necessary information, make an accurate diagnosis, and develop a plan for treatment. In short, video visits result in the same desired clinical outcomes as in-person care when used appropriately. Stroke: In a study to assess whether telestroke consultations were superior for decision-making purposes than telephone-only consultations, the former won out—with researchers determining that telemedicine-based consulting resulted in more accurate decision-making. Chronic Obstructive Pulmonary Disease (COPD): A study to assess “Using Telehealth technology to deliver pulmonary rehabilitation in chronic obstructive pulmonary disease patients” concluded that telehealth pulmonary rehabilitation was an effective tool for increasing access to services, and improved both quality of life and capacity to exercise in comparison with the traditional approach. Follow-Up Exams – Providers often recommend a follow up visit after beginning a course of treatment. These visits are important to the ultimate resolution or management of the problem. Doing them remotely makes it easier for you to comply with the doctor’s recommendations. Urgent Care – Both traditional practices and stand alone clinics are starting to offer telemedicine as an option for urgent care needs. Conditions such as the flu, sinus infections, urinary tract infections, and more can be effectively treated without an in-office encounter. Specialty Care – Telemedicine makes it possible for patients to get access to the best specialist for their needs, not just the closest. You have every right to be concerned about the privacy and security of your confidential medical information. While today’s digital world offers a lot of convenience, there are risks. 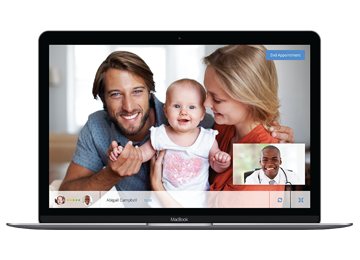 Fortunately, there are telemedicine solutions on the market that have been designed specifically to protect patient information and meet the strict standards of the Health Insurance Portability and Accountability Act, known as HIPAA for short. Be sure to ask your provider if the solution they use is HIPAA compliant, and never agree to a video visit over consumer grade applications like Facetime or Skype. We have an entire page dedicated to the details about insurance coverage for telemedicine. The short version is that many state legislators recognize the advantages of telemedicine for patients and the healthcare system as a whole. In fact, 26 states have passed laws requiring private insurance companies to reimburse providers for video visits. Many insurance companies also see the value of telehealth and pay for video visits even when they are not required to by law. Your insurance company and your provider can help you determine if your policy will cover telemedicine. Telemedicine has been around for decades, but it is just now becoming more mainstream. For many patients, the approach is new, but it is also effective, secure, and affordable. If you want to eliminate travel expenses and cost, avoid missing work, and stay out of crowded waiting rooms full of sick people, why not give it a try? Ask your provider if they offer remote visits via telemedicine.